Review: The Apprenticeship of Duddy Kravitz by Mordecai Richler. This was probably my third time through this novel, although I didn’t read it in high school like so many other Canadian kids. I was prompted for this reread by the Books on Film presentation of the digitally-remastered copy of the film that was recently completed. I love everything of Richler’s that I’ve read, probably most of his canon. In this case, he writes what he knows: Jewish life in the St. Urbain neighbourhood in Montreal. He portrays a young man seeking, ultimately, the approval of his grandfather, whose advice is that “a man without land is nothing”. Last night was a CanCon lover’s dream. The screening of the newly-remastered digital print of “The Apprenticeship of Duddy Kravitz“, based on the novel by Mordecai Richler, was the TIFF Books on Film event, and as we walked in to the screening room, we immediately noticed the 30 or so seats that had been reserved for special guests. Margaret Atwood’s name was the first to catch my eye. Richler’s widow Florence and children Noah and Jacob were also in attendance. Jesse Wente, Head of Programming at TIFF, opened the evening and introduced the CEO of the Academy of Canadian Cinema and Television, Helga Stephenson. Her announcement that a copy of the beautiful digital print had been donated to TIFF so that it could be shown whenever possible was met with great applause. 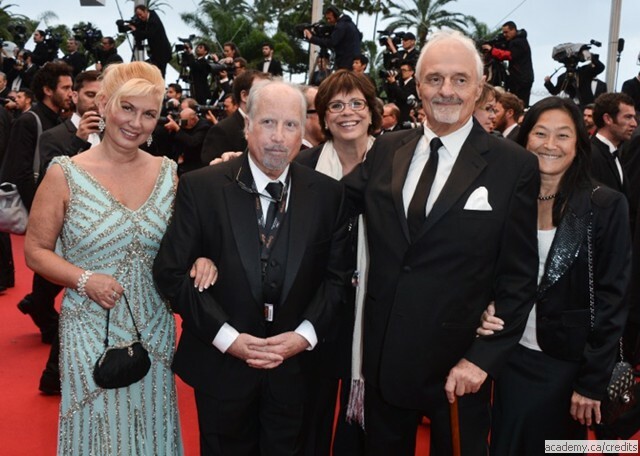 Last week, the film finally had its Cannes debut in the Cannes Classics program, and director Ted Kotcheff and Richard Dreyfuss were on the red carpet. Eleanor Wachtel, our host for the Books on Film series, followed with a welcome and gave a bio of Kotcheff, our guest for the post-screening interview. (The ACCT bio is here.) Kotcheff then spoke of his 44-year friendship with Richler that started in the South of France. He wanted to make a film of Duddy for years, and finally got funding in the early days of the Canadian Film Development Corporation (now Telefilm Canada) when they covered half of the $750,000 budget for the film, with Gerald Schniederman covering the other half. Mr Schneiderman’s widow Roberta was at the screening last night and Kotcheff called her out to applause. As Stephenson said in her remarks, the newly remastered print makes the film look like it was shot yesterday. I’ve seen the original at least twice, and Dreyfuss’ performance is amazing. Kotcheff described the casting of Duddy as a bit of a nightmare. He didn’t want to make the film until he found the perfect lead. As they got very close to the shoot date, Kotcheff put in a call to NY casting director Lynn Stalmaster who, after reading the script, called him down to see a young guy who had a four minute scene in a previous film in which the kid had overacted. The moment he began to read for the part, Kotcheff knew he had “his Duddy”, the only issue being that Dreyfuss, a German Jew, had blue eyes. In Cannes, Dreyfuss commented that Duddy was his best role, and that he didn’t realise this until many years later. And in my mind, when I read the novel, it is Dreyfuss who forms my mental image for Duddy.